Good-hearted witch Xan has made a habit of rescuing the babies abandoned in the wood each year by the people of the Protectorate. Xan doesn’t know why the people of the village condemn one child to the forest each year, but she has a soft spot for babies and is happy to find them loving homes in villages where children aren’t abandoned so easily. Xan’s never been tempted to keep a child for herself, though, until she finds Luna. In a moment of temptation, Xan lets baby Luna gulp down moonlight, which everyone knows will fill the drinker with powerful magic. The act seals Luna’s fate, and, along with a wise swamp monster and a tiny dragon, the baby and the witch become a family. Luna’s magic comes with a price, but it’s a price they won’t have to face until the little girl turns 13—and then, Xan will help her through it. Of course, what Xan doesn’t know is that the Protectorate’s people have been taught that their village’s youngest baby must be sacrificed each year to appease the evil witch in the woods. But if the evil witch isn’t real, what is the Protectorate hiding from its people? I thought this little middle grades fantasy was just lovely—a worthy precursor to authors like Gaiman and LeGuin. Barnhill has a knack for telling a complex story in deceptively simple, lyrical fairy tale language, and the way she teases the individual threads of this story together—the brave boy, the magical girl, the witch’s forgotten history, the mad mother—is brilliant. The characters—minor and major—live and breathe; the world of the story feels sturdy enough to stand on its own. 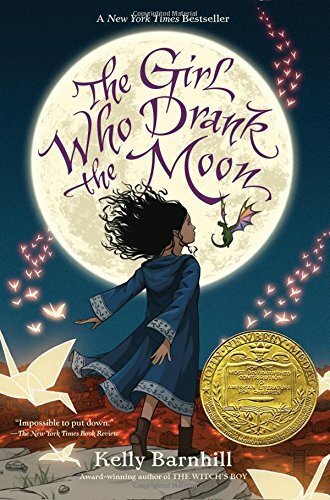 Like other fairy tale books—Egg and Spoon, West of the Moon—The Girl Who Drank the Moon follows its own rhythms toward its own conclusion, which I love, but which I know can be off-putting for some readers. Luna’s relationship with Xan is perfectly written, and Luna’s poor mother, who is locked up as a madwoman after the Protectorate sacrifices her daughter, is heartbreakingly real. And Luna’s story, as she moves out of childhood and into adolescence, feels right—she earns her place in the world of adults, and she gains things and loses things along the path to get there. I always say, it’s easy to talk to about books you didn’t like and hard to talk about those you do. I liked this one so much, I can’t seem to talk about it at all—which means you should probably stop reading this and just go ahead and add The Girl Who Drank the Moon to your reading list. A teenager starts a feminist revolution, Humpty Dumpty adjusts to life post-Great Fall, the Bronte kids create a dangerous imaginary world, a RenFaire girl finds middle school challenging, and more great books to read this fall.